BUSIA – President Museveni on Monday summoned Busia District leaders to his country home in Rwakitura and ordered them to endorse Mr Geoffrey Wandera as the duly elected LCV chairperson. Wandera was declared unopposed for the district seat in controversial circumstances after two independents Chrispus Bwire and Tony Ojambo withdrew from the race. The favourites for the seat; DP’s Deogratius Hasubi Njoki and NRM’s Paul Boniface Oguttu had earlier been disqualified from the race. Wandera was sworn in despite a High Court order filed by DP barred the Electoral commission from gazetting him. And on December 7, the district council passed a resolution, rejecting the election of Mr Wandera as the district chairperson. But while meeting the district officials that included councillors and opinion leaders on December 31, the President insisted that Wandera’s election was lawful and must be respected. 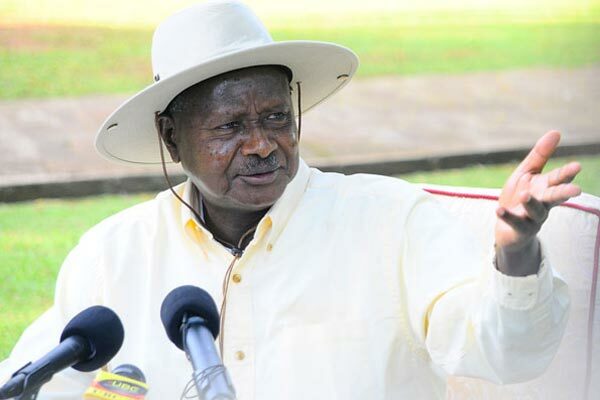 “The Electoral Commission has rules and regulations that govern elections and one of the rules is that in the event that all the other candidates nominated for the some position withdraw their candidature, automatically the remaining candidate is declared winner,” Museveni said. He told the councillors opposed to Wandera’s election to challenge the decision in courts of law but not rejecting him in the council. “Those rejecting him are the ones promoting illegalities because whoever is dissatisfied with the process has the right to petition court,” he said. He also urged leaders and residents to stop disturbing the chairperson, saying this will as a result affect service delivery. The President said Busia is one of the districts facing challenges of land fragmentation, which he said is affecting agriculture productivity. Mr Museveni, however, said if farmers took to the cultivation of fruits, rearing of poultry, diary farming and coffee growing, they would greatly improve on their house hold income. Mr Julius Maganda, the state minister for the East African affairs, who also attended the meeting, told the President that there was need to open and tarmac the Mulwada road to easy transportation. He also asked the President to order for expedition of the program of rural electrification in the sub counties that did not have access to the grid. The seat fell vacant in May, 2018 after Court of Appeal in Mbale District threw out Mr Ouma Adea on grounds that he had been convicted of corruption in 2013. On November 27, the Electoral Commission (EC) gazetted Mr Wandera as the chairperson the same day the High Court in Mbale issued an interim order stopping the said exercise. Mr Deogratius Hasubi Njoki, through his lawyer Yusuf Mutembuli, had petitioned the High Court challenging the decision of the EC to kick him out of the race. The EC cancelled Mr Njoki’s nomination and that of the ruling National Resistance Movement (NRM) party candidate, Mr Paul Boniface Oguttu, who were the main contenders in the race on separate grounds.